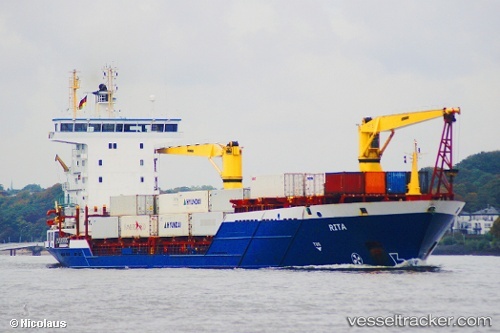 In the morning of Dec 2, 2014, at 06:50 a.m. the "Rita" was in collision with the German container ship "Cap San Augustin" in the Waltershof Port in Hamburg. The "Rita" was shifting with pilot'a assistance from the Container Terminal Altenwerder to the Burchard Quay. While turning around in the Waltershof Port, she hit the "Cap San Augustin" which was berthed at the quay. The starboard side wheelhouse of the "Rita" was dented, the "Cap San Augustin" suffered scratches. The sailing ban pronounced by the Water Police has meanwhile been lifted while the investigations were going on. At 1 p.m. the "Rita" left the port bound for Tananger, followed by the "Cap San Augustin" at 2 p.m. which headed for Antwerp. The "Rita Sibum" on Jan 11 was sold for 11.5 million Euros to the specially created First Fleet Rita. The insolvent one ship Company is identical to the new one, and by this it was prevented that the ship was detained. Currently the ship is equipped with two on-board cranes. From February it will sail again for the Hamburg based shipping company on a three-year contract mainly in Norway.